Summer Strawberry fruit snacks are enlivened with the taste of juicy strawberries. 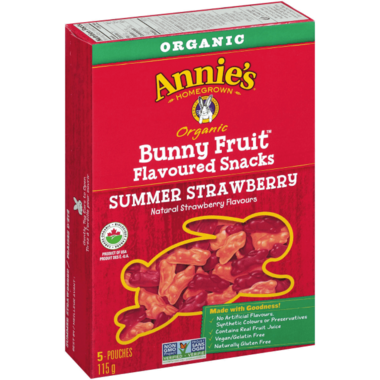 Certified organic, these bunny-shaped fruit snacks are made with real fruit juice and packed with 100% Daily Value of Vitamin C.
Ingredients: ORGANIC TAPIOCA SYRUP, ORGANIC CANE SUGAR, ORGANIC TAPIOCA SYRUP SOLIDS, ORGANIC WHITE GRAPE JUICE CONCENTRATE, PECTIN, CITRIC ACID, ASCORBIC ACID, COLOR (BLACK CARROT JUICE CONCENTRATE), NATURAL FLAVORS, SODIUM CITRATE, ORGANIC SUNFLOWER OIL, CARNAUBA WAX (FROM PALM LEAVES). The best flavor! My kid loves it and so do I! The kids love them, and I love that they are a natural choice. My toddler loves these gummies. Will definitely purchase again. I haven't tried them so can't comment on the taste or texture, but my kids love them and I like that they're natural! Couldn't get past the odd texture of these gummies- had to donate them to the local foodbank. Pricey. Odd texture from other fruit gummies. One kid loved them, the other didn't. A little pricey but good flavour though. Great flavour. I always keep a bag in the diaper bag! Delicious! Nice and soft, very fresh. These aren't chewy and gummy like other fruit snacks. They're easy for little ones to chew and don't get stuck in your teeth. You can sure tell they're made with real fruit! Really juicy! The texture is different from usual chewy snacks and easier to eat. these gummies are amazing!! they taste so good and I LOVE the fact that they are vegan! most gummies have gelatin in them, but not these yummy treats! they are a bit expensive, but I'd rather pay more for something that's healthier and more ethical than the alternative. will definitely buy again! Just tried these and the kids love them! They are a safer alternative for my son who reacts to artificial colours and flavours. Would love to see them come in larger boxes rather than small packs. Out of all the gluten free, lower in sugar & vegan alternative products like this one, our taste & texture sensitive boys loves this product the best! I would love for there to be a case like sizing on sale as well because we use up a box very quickly. My daughter loves Annie's gummies. Her favourite snack. I have tried them and the flavour is delicious! Received this product today and was disappointed to open the box and only find 4 pouches inside. Poor quality control on the part of the manufacturer. Will not purchase again for this price. These are a favourite in our house, even I like these. A nice treat that is better than the typical fruit snack. Great for lunches. Soft, chewy and very flavourful. My daughter loves them and great for an easy snack on the go. My kids love these. They went pretty quickly need to order more. These were a welcome addition to our Easter celebration. Really enjoyed these. Bought them as an Easter treat. Very tasty, but to expensive for regular purchases. the taste of this organic snacks is good but the price is too high & amount isn't enough ! Never will buy again ! My kids love them! Better than the artificial alternatives. DD absolutely loves these. A bit pricey for what you get in the box, but nice for an occasional treat! My kids really like these, a bit pricey though. I buy these for my granddaughter; she loves them and asks for them when I run out. Even I liked these and great for kids who have gone gluten free! These are very tasty. I bought for a healthy snack for my granddaughter. They are expensive though. My daughters and husband didn't like it at all. Best tasting snack I've tasted! But a bit too expensive for the amount you actually get. This is a wonderful treat, the only problem is just eating one packet. My daughter loves these fruit snacks and I love that they don't have any artificial flavours or coloring. My granddaughter loves these snacks. Because they are expensive I save them for a special treat! Very good, and GMO free :) I don't mind the price cause candy is a treat in our house not an all the time thing. Great taste and they made a healthier treat for Easter. Love the cute bunny shape too. LOVED these and so does my 2 year old!! My daughter loves these, actually the entire house loves them. Great as a treat. These are seriously the best fruit snacks ever! My husband and boys cannot get enough of them. They are a little on the pricey side for what you get, but I don't mind paying more for an all natural product...I know what everything in them is, which is nice! The product is delicious but not worth it for full price. While I give this product five stars for taste, the packaging is incredibly deceptive. that are packed into this big old box were a huge disappointment. Definitely not worth the money.